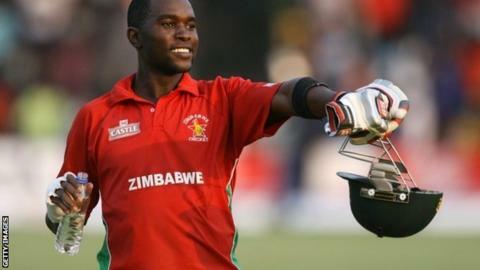 Captain Elton Chigumbura hit an unbeaten half century as Zimbabwe defeated Australia for only the second time in a one-day international. Zimbabwe, chasing 210 for victory, won with 12 balls to spare to claim a famous three-wicket win in Harare. It was the team's first ODI win over Australia since the 1983 World Cup, their first ever meeting. Since then Australia, world champions four times, have won 27 meetings, with one match abandoned. However, Zimbabwe won on the only occasion the sides have met in Twenty20 internationals - a five-wicket success at the inaugural ICC World T20 in 2007. Sunday's match was the fourth game in a triangular ODI tournament that also features South Africa - and Australia won their previous match against the hosts by 198 runs. South Africa, who play Australia in the next match on Tuesday, have won both of their games so far. Australia had won the toss and elected to bat, but found it hard going as Zimbabwe's spinners claimed six of the nine wickets to fall. Returning skipper Michael Clarke top scored with an unbeaten 68 but suffered a recurrence of his hamstring injury and retired hurt in the 43rd over before briefly returning in the last over of the Aussie innings. Australia announced after the game that Clarke would take no further part in the tri-series, and would return home to Sydney on Tuesday for scans and further assessment. "Zimbabwe have been waiting 31 years for this. This is a very special day. If you could see the jubilation in the crowd with singing and dancing in the stands you would understand just how important this win was both for the players and the people of Zimbabwe. "By playing series like this against two of the stronger teams in the world - South Africa and Australia - is the only way Zimbabwe are going to improve and get back to the way they once were." The visitors had been reduced to 97-5 before Clarke and wicketkeeper Brad Haddin added 50 for the sixth wicket, and they eventually finished on 209-9. Chigumbura, who came to the wicket with Zimbabwe struggling at 106-5, struck his unbeaten 52 off 68 balls, including four boundaries, to steer his side to victory. He added 55 in an unbroken eighth-wicket stand of 55 with Prosper Utseya, who made 30 not out. In Zimbabwe's last ODI series, they drew 2-2 with Afghanistan.